Your horse’s body is made up of more than 100 000 different proteins. There are proteins in hair, in eyes, in blood, in muscle, in every single cell of your horse’s body. Protein actually makes up about ¾ of the dry weight of most living cells. They are involved in many of the essential functions of life as nutrient carriers, enzymes, antibodies, etc. Proteins are made up of smaller “building blocks” called amino acids. There are two types of amino acids – essential and non essential. Non essential amino acids can be manufactured by the body if they are needed. Essential amino acids must be provided in the diet as they can’t be made in the horse’s body. Once a protein has been eaten, it is broken up by the body into these smaller molecules. Then the amino acids are dispatched to wherever they are needed in the body for protein synthesis. Imagine a huge factory with DNA “workers” standing at a “conveyer belt” assembling protein molecules. (DNA, the molecule that forms genes, is coded with specific recipes for proteins – this determines what we look like, think like, what colour eyes we have, etc.) Along the “conveyer belt” come the amino acids that we have consumed. Each “worker” collects the amino acids he needs and puts them together according to the specific recipe encoded on the gene. The amino acid which most often causes this problem is called lysine. It is known as the first limiting amino acid. The second limiting amino acid is usually threonine or tryptophan. This is why protein quality is of such utmost importance. When ordering your horse’s feed from your supplier, you will probably ask for a 12% meal, or whichever version you feed. What exactly does this mean? The value refers to the total amount of protein in the food. The interesting thing is that it’s not so much how much protein is in the feed that counts – it is the quality of that protein that is important. In other words, some proteins are better than other proteins. 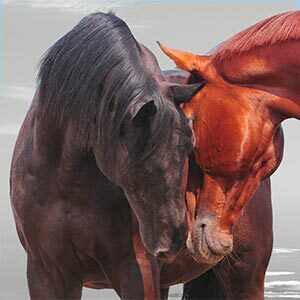 The best protein, from a horse’s point of view, is one in which the amino acid profile is exactly what the horse needs. So, the DNA “worker” described above has exactly what he needs to do his job – making a specific protein with none of the essential amino acids missing. Some proteins are of such low quality, they are totally useless and you might as well not feed them at all. During hard training, the equine athlete will damage muscle tissue as a result of lactic acid production and over exertion. These damaged tissues need to be repaired as soon as possible. This, of course, is a process that requires protein synthesis. As does the building up of muscle tissue from scratch when training. Growing horses also need much more protein and amino acids than average. If your horse fits one of these categories – building muscle, growing or in hard work, it would be wise to supplement his diet with a source of amino acids and proteins. The Herbal Horse products which are suitable are: Sport Horse mix, Endurance mix.